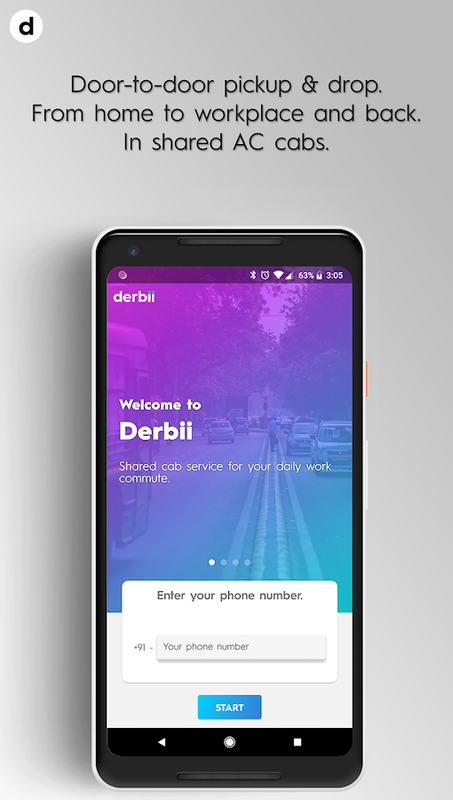 Derbii is a door-to-door pickup & drop service for your regularcommute. Use the app to specify your route and we match you up withothers going and returning your way. AC cabs pick you up at yourdoorstep and drop you straight to office while costing you muchless than what you spend commuting using your own vehicle orradio-taxis and saving the time you spend driving or jostling forspace on public transport. Derbii is designed for daily commute toworkplace and back, keeping convenience and affordability in mind. * SHARED, AIR-CONDITIONED CABS Travel with people like you, inchauffeur driven air-conditioned cars. * DOOR-TO-DOOR SERVICE.DAILY We pick you up from home and drop you at your office andback. Same time, every day. * FIXED MONTHLY PRICE. NO SURGEAll-inclusive, fixed subscription amount per month. No surge priceor hidden costs. * SAFE AND RELIABLE The same verified chauffeur,comfortable car and trusted route every day. * CHAT WITHCO-PASSENGERS Chat with your co-riders in real time. No need foranother messaging app. * EFFORTLESS CONVENIENCE Ride in comfort allthe way feeling right at home. We ensure minimal stoppage times sothe major part of your trip is non-stop. The time you spend drivingor waiting for the bus or holding on to your spot in the metrocould now be spent reading the news or simply taking a nap. *FAMILIAR COMFORT Specify your home and office addresses using ourmobile app and we'll fix you a cab with others going your way. 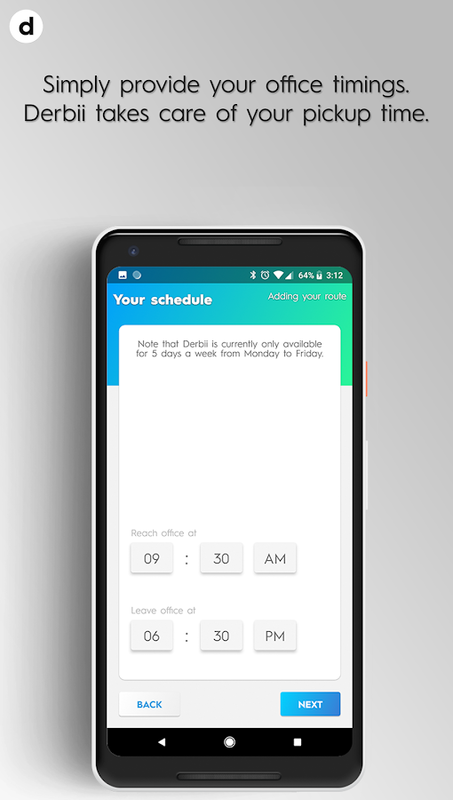 Thecab will pick you up at your doorstep and drop you right at youroffice. No more changing transport or trundling in the heat anddust. *UNBEATABLE PRICES Pay less than what you spend on commutingusing your car. Pay less than what you pay a radio-taxi. Sometimes,pay even less than what you pay to use public transport. And payless in terms of your time and energy. Our customizable paymentstructure will make it an even sweeter deal. *DEDICATED SUPPORT Weput the highest premium on customer support. If you're facing anissue, no matter how insignificant, do not hesitate to contact us.Our customer support team is available 24x7 and we pride ourselveson our minimal response times. 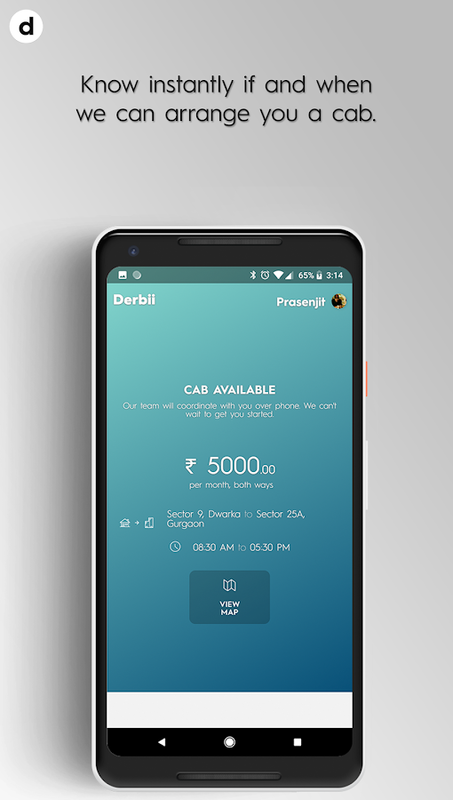 Derbii is available across Delhi/NCR- New Delhi, Gurgaon, Faridabad, Manesar, NOIDA, Greater NOIDA andGhaziabad. If you live or work in any other areas close by, wecould still probably serve you. Just drop us a mail [email protected] or simply call us at +91-801-00-55-999 and we'llhelp you out. The application allows you to call a taxi online in Kharkiv,Dnipro, Kyiv, Odessa, Zaporizhia, Poltava, Vinnytsia, Sumy. You canalso call on a free short number 2000 (callback). Reliable servicehelps you to quickly and cheaply reach the airport, the trainstation or get around the city without unnecessary calls to theservice. Advantages • Calling a taxi for multiple addresses• Instant calculation of the trip cost, mileage, and travel time.• Pay by card (not available in some cities) • Calling a taxi of adifferent class (economy, standard, comfort, business).• Evaluating drivers and add comments to the completed trips.• Booking a taxi with additional services: "air conditioning","empty trunk», «roundtrip", "sober driver" - clients' car deliveryto the specified destination. • Calculating the start point byphysical location of the client. • Ordering a taxi "On now" and "Ontime” • Order history allows you to repeat the trip or go to theopposite direction quickly. • The ability to add tips. The OnTaxiapplication helps you booking a taxi online in: • Kyiv; • Kharkiv;• Dnipro; • Zaporizhia; • Odessa; • Poltava; • Vinnytsia; • Sumy.OnTaxi – quick and cheap online taxi service. Kharkov and all itsmost inaccessible streets, alleys, houses have become closer.Public transport is not always takes you where can drive a taxi.Kyiv, Dnipro, Zaporizhia, Kharkiv, Odessa, Boryspil, Poltava,Vinnytsia, Sumy choose OnTaxi. The best way to evaluate thefunctionality, quality, simplicity, and usability of theapplication is to download it and call taxi right now. Find moreinfo about the service https://ontaxi.com.ua. Client support isavailable 24/7. Convenient and Safe Trips with iTaksi! iTaksi is an online taxiservice, developed by Istanbul Metropolitan Municipality (IBB) toensure both passengers’ and taxi drivers’ safety and comfort.Download it now and enjoy your first trip today! What are thefeatures of iTaksi? You can calculate the estimated fare for yourtrip in advance with iTaksi. Before requesting a taxi, justnavigate to the “Calculate Fare” menu and simply find out theestimated duration and fare for your trip. The nearest taxi will bedirected to you at the touch of a button, without having to searchor wait for a taxi. iTaksi offers you three (3) different vehicleoptions depending on your needs. Traditional yellow taxi, turquoisetaxi for more comfortable rides and black taxi for the mostluxurious taxi rides. You can make your payment in three differentways - in cash, with credit card or istanbulkart™. You can chooseamong the payment alternatives before hailing a taxi and see thetrip fare on the application at the end of your journey. You onlyneed to enter your credit card details once. You can rate andreview the driver and the ride upon the completion of the trip. Youcan save your frequently used addresses to the “Favorite Addresses”section and speed up the taxi hailing process. iTaksi vechicles areequiped with dual cameras and the cameras capture and store videowithout sound, ensuring safety. You may share your suggestions andcomplaints about your taxi trips with iTaksi at Alo 153 in Istanbulor on our website, itaksi.com. Commut is a minibus shuttle service for daily office commute inHyderabad. We operate air-conditioned minibus shuttles at highfrequency between popular routes in Hyderabad at most affordableprices. With our smart travel solution, we are here to make dailyoffice commute a smooth and hassle-free experience. We currentlyrun 70+ shuttles between 50 major areas of Hyderabad including LBNagar, ECIL, Malkajgiri, Uppal, Himayatnagar, Hitec City &Gachibowli. With strict security features, regular vehicle &background checks, we offer commuters a safe and comfortable travelexperience. 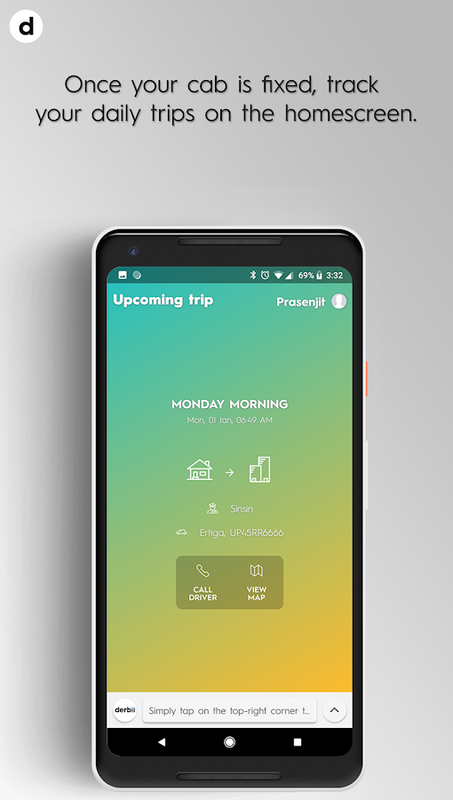 Key features of Commut:• Point to point service•Stress-free and pollution-free rides• ETA and live-tracking ofvehicles • Route optimization and least travel time • SafetymeasuresUsing the Commut app is really simple:→ Select your pickupand drop point. → Select your preferred ride from the list ofavailable rides.→ Confirm your ticket by tapping on ‘Book Now’.→Get instant confirmation with driver details.→ Use the Commutwallet for a seamless and cashless experience.Best way to travel towork is now available in Hyderabad!